We value your business and wanted to create a way to reward your loyalty. Now every dollar you spend will earn you rewards. To become a member simply ask your server at any of our two locations. Your card will be activated the first time you use it. Then after it is activated, you will go to here and register your card to receive 10 bonus points. One dollar spent earns one point. Every 100 points you earn a $10.00 reward will be added to your card. Cards have no cash value and are not transferable to another member’s account. Cards will be redeemed to the lowest $10 increment. 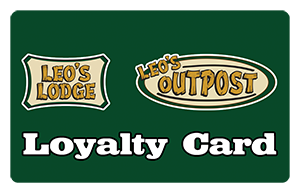 Leo’s loyalty card may not be used in conjunction with any other offer, discount, promotion or promotional menu. 500 point maximum accrual daily, and on parties and events. Only the registered card holder or spouse paying the bill may accrue points. For your protection, you may be asked for I.D. when using the card. Only one card may be used per check. Separate checks on large parties for the purpose of acquiring points beyond daily maximums are not permitted. Leo’s is not responsible for points or rewards lost due to fraudulent or unauthorized use. This includes fraud cause by lost cards.